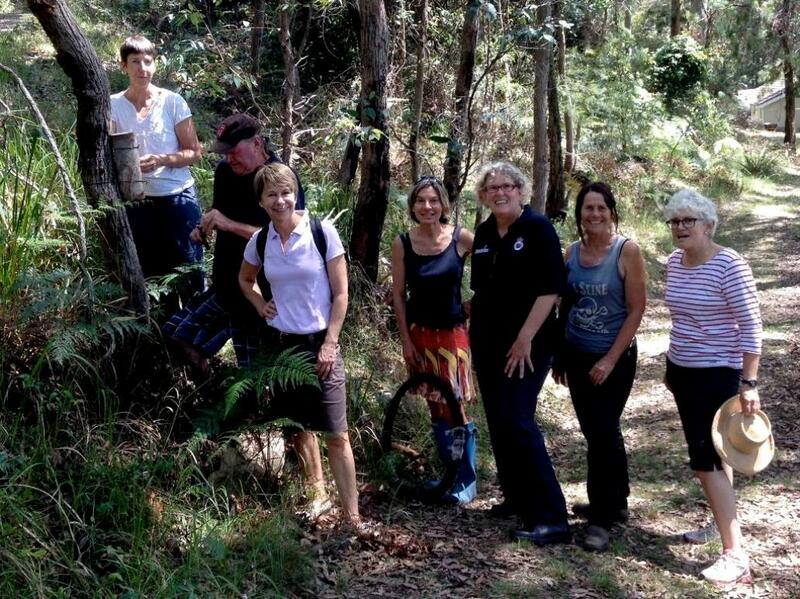 A community driven Pygmy Possum Project has attracted state funding to Pittwater. The mini grant of $1500, awarded by Greater Sydney Local Land Services, will fund the purchase of 2 high quality wildlife cameras. These cameras will support an ongoing monitoring program to establish data on the location, frequency and seasonal movements of the Eastern Pygmy Possum on the Western Shores of Pittwater. Other visitors to the nesting boxes, such as Feather-tailed Gliders and Antechinus, will also be recorded. The funding applicant, Rocky Point Bushcare, was backed by Pittwater Council, the Pittwater Natural Heritage Association (PNHA), and local state member Rob Stokes. Twenty-nine nesting boxes have already been purchased by residents and placed at the back of properties throughout Elvina Bay, Lovett Bay and Towlers Bay. The project team then visited the Strickland State Forest on the Central Coast to look at the nesting box program run by State Forest Ecology Supervisor and project mentor, Alf Britton, before commencing their pilot monitoring program back in Pittwater. On May 11 Rocky Point Bushcare will be hosting a Wildlife Camera Workshop on site to enable wider local community use of the cameras. Pittwater Council’s Andrew Jennings will run participants through the settings, range, placement, image capture options, downloads and possible outcomes through the use of the cameras. A third camera will be loaned to the project by the Pittwater Natural Heritage Association. Further technical and scientific advice will be provided by Coastal Resource Management specialist Christine Soul, Research Scientist Dr. Brad Law and Pittwater Council’s Bushland Officers. The cameras will support weekly visual observations at different locations through out the year and build community capacity in environmental data collection. "Good partnerships are the key to community participation", said Rocky Point Bushcarer Lesley Stevens. "They raise the ambition bar. What started as an ‘interest group’ has now become a monitoring project, backed by local expertise, other community associations, strong Council support and financial support from state government." The Western Shores Pygmy Possum Project was kick-started by a local resident’s discovery of an Eastern Pygmy Possum in a Towlers Bay laundry basket. This was the first recorded sighting of an Eastern Pygmy Possum in Pittwater in European times. 2 weeks later Pygmy Possums were found in specially made nesting boxes placed along the Ingleside escarpment. The project team is keen to involve as many residents as possible and is considering running a ‘Backyard Camera ‘ program for one month a year so that residents can record the nocturnal visitors to their gardens each night. "Essentially we are fringe dwellers on the edge of Ku-ring-gai Chase National Park," said Ms Stevens. "When you live next door to someone it’s helpful to understand their habits, friends, lifestyle, and enemies. That way you all get along much better." This is the third community project hosted by the Rocky Point Bushcare group. The group partnered with the Asparagus Fern Out committee to run a series of highly successful days at its bushcare site and last year partnered with the Elvina Bay Rural Fire Service in an asset protection and regenerative burn off, also on site. The eastern pygmy possum (Cercartetus nanus) is a diprotodont marsupial of south-eastern Australia. Occurring from southern Queensland to eastern South Australia and also Tasmania, it is found in a range of habitats, including rainforest, sclerophyll forest, woodland and heath. Eastern pygmy possums are very small, weighing from 15 to 43 grams (0.53 to 1.52 oz) and having a body length of between 7 and 9 centimetres (2.8 and 3.5 in) with a 8 to 11 centimetres (3.1 to 4.3 in) tail. They are dull grey above and white below, with big, forward pointing, almost hairless, ears and a long prehensile tail, with thick fur at the base that becomes sparser towards the tip. They have long whiskers, and a narrow ring of dark fur around each eye. The first specimen of an eastern pygmy possum known to Europeans was collected by François Péron, a naturalist aboard Nicolas Baudin’s voyage to the south seas. Whilst on a short stay on Maria Island, off eastern Tasmania between 19 and 27 February 1802, Péron traded with the Aboriginal inhabitants for a single small marsupial. Bones of this species are often recorded as fossils or sub-fossils from late Pleistocene (126,000 to 9,700 calendar years BCE 'before the Common Era') and Holocene (11,700 years BP: 'before present until present )cave deposits in south-eastern Australia.